Kyergangpa was born to the Ba family in the upper reaches of Nang County. He studied and practiced intensely during his teenage years. At the age of sixteen he joined the retinue of his uncle Thamché Khyenpa who was proceeding to Draklha. 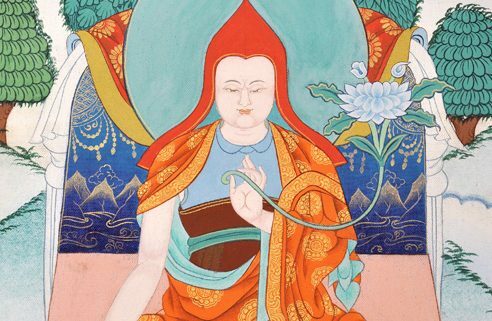 He received the complete Avalokiteshvara teachings from a great practitioner of Avalokiteshvara, Pakpa Chegom. 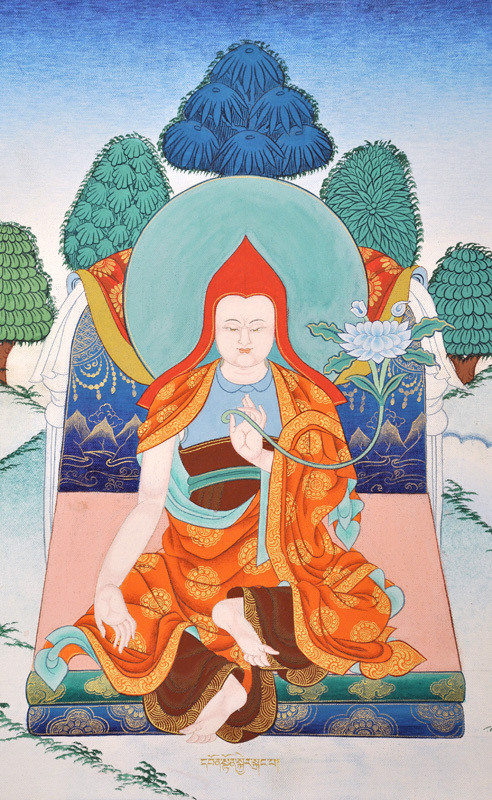 Through practicing in solitary retreat for four and half years Kyergangpa received a vision of Avalokiteshvara. Through his teacher Tsari Gompa in Latö, he received the complete instructions of Rechungpa. Kyergangpa spent five years with Lama Penpukpa Chenpo and receive all the practices and instructions of lord Atisha. Lama Penpukpa also happened to be a teacher of the first Karmapa Düsum Khyenpa. From Mokchokpa, the great adept at Lhabu in Shang, he mastered the teachings on Clear Light, Dream Yoga, and Illusory Body and had uninterrupted vision of many deities. While Kyerganpa was practicing diligently, he was informed that his uncle Ba Thamche Khyenpa had passed away. Lama Kyergangpa was particularly devoted to the deity Hayagriva. Accordingly, in his dream practice, he visited the pure realm of Guru Padmasambhava repeatedly and received the full transmission of the Secret Accomplishment Hayagriva (rta mgrin gsang sgrub). As advised by Guru Rinpoche, he also requested these transmissions from a treasure revealer in Tibet, known as Nyemo Tertön (snye mo ba sangs rgyas dbang chen aka rgya gong ri pa sangs rgyas dbang chen, 12th century). He greatly surprised the Tertön with his requests for this practice because the Tertön had kept his discovery of these teachings a complete secret. Two times the Tertön withheld some secret oral instructions, only to be asked specifically for them later. Thus it became apparent that Kyergangpa could only have been advised to ask for them by Guru Rinpoche in person. This Hayagriva cycle of teachings continues to be practiced among Shangpa practitioners to the present day. According to the advice of his Lama, Mokchokpa Rinchen Tsöndrü, and the request of the people of Kyergang, he took over the monastery of his uncle, reconstructed it and established the Shangpa lineage there. His precious lama died several years later. Kyergangpa had many students and lamas in Shang who had visions of Avalokiteshvara. Among his disciples Nakpo Zhontrül, Drakpa Yeshi and Rigongpa Chökyi Sherab were the best. Öntön Kyergangpa is the fifth of the Initial Seven Jewels of the Shangpa Kagyü.